If you have a second home or a portion of your property has been left empty, you can use this opportunity as a way of earning few extra bucks on a monthly basis. You need to find a renter, who will take your property on lease on a monthly basis. Month to month lease means the contract for lease will be renewed on a monthly basis, and the renter will have to pay a monthly rental amount to the owner. 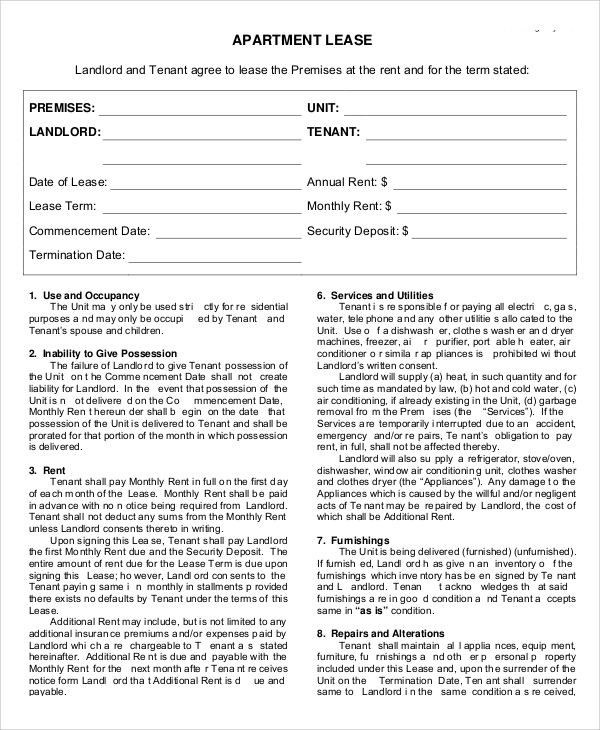 To create such settlements, the Sample Blank Lease Agreements are required. Month to month lease agreement is a difficult thing to be crafted. To make sure that your agreement has been written correctly, choose this sample as it covers all the vital aspects of such agreements. If you have an empty apartment, it is evident that you should go for renting it. To rent an apartment, make a lease contract with the renter. Make the lease type as a month to month basis for convenience. 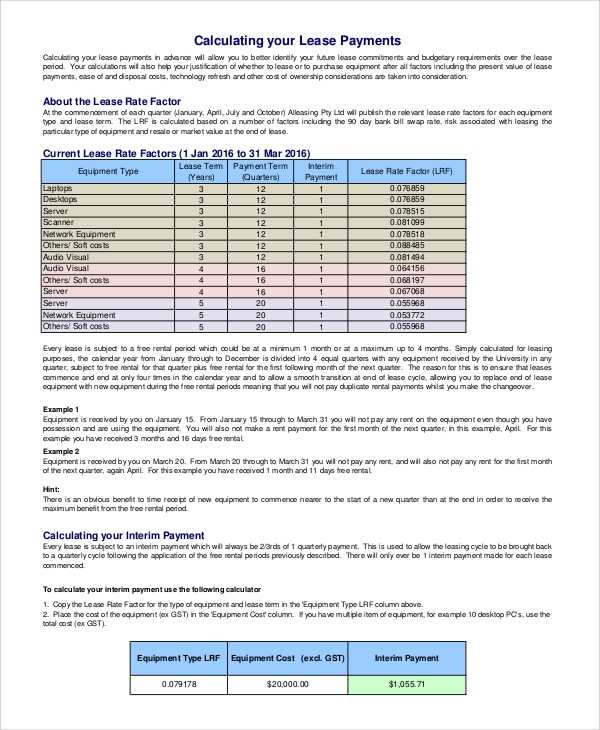 You can use this monthly lease calculator to calculate the lease rent. You can simply download this calculator, and it is available for free. Downloading will take only a few minutes. 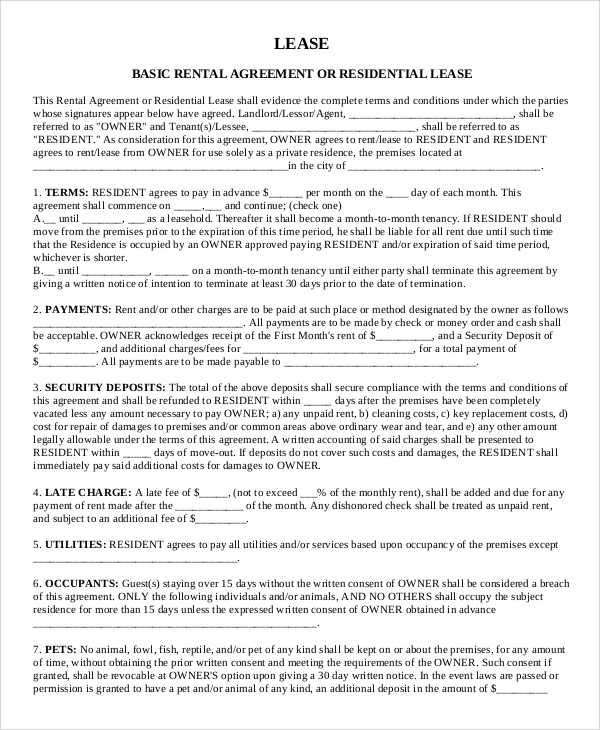 For an effective residential lease rental agreement, you can always use this sample for creating the agreement statement. Using this sample will make your agreement statement well versed and properly crafted. 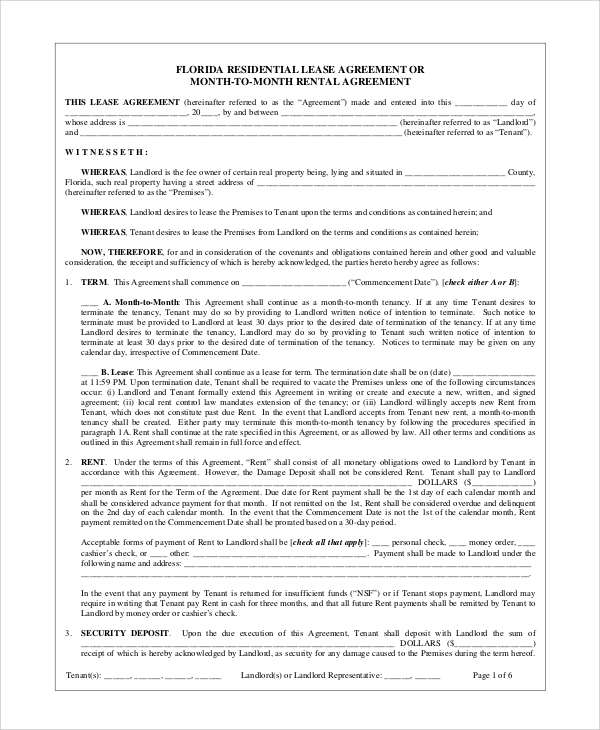 When you make a lease agreement, it is important to mention the possible conditions for termination of the agreement. 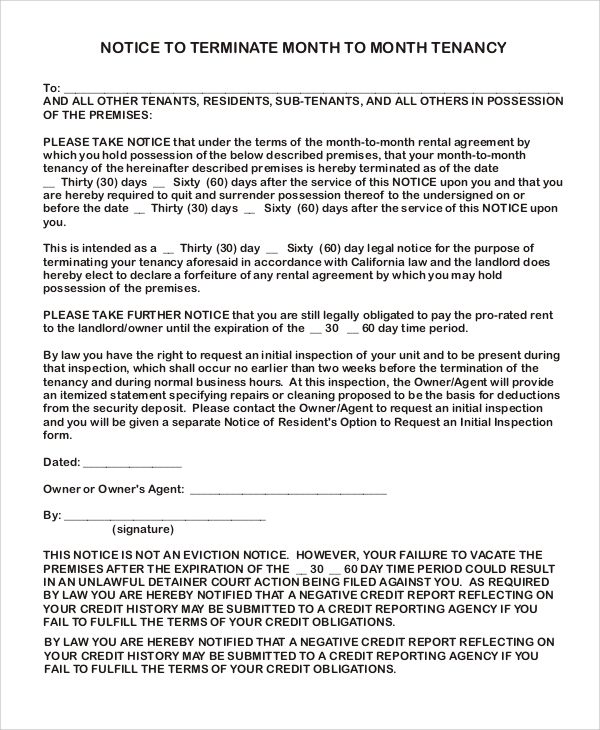 For initiating the process of lease contract termination, this sample letter format is recommended for you. For understanding the month to month lease agreement, it is important to understand the definition and overview of general lease agreements. 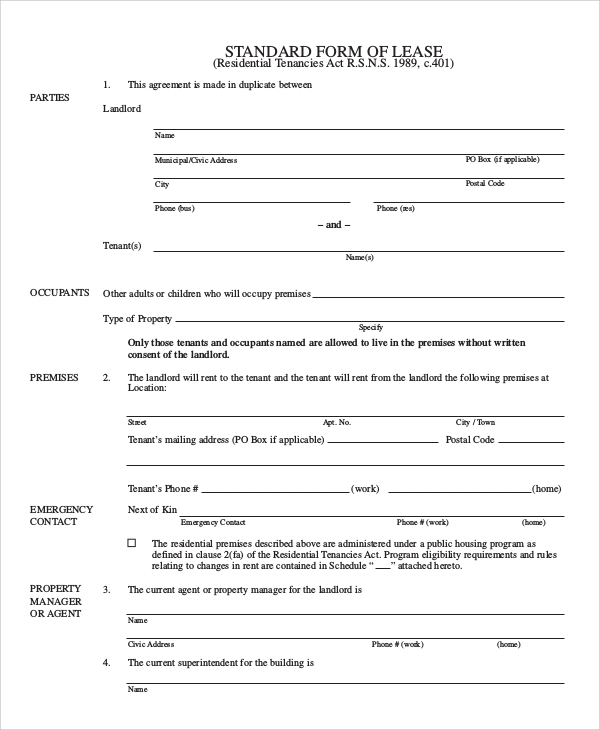 The lease agreement is crafted when you decide to put a property on lease to someone. It can be a house or other movable asset. You can also see the Commercial Lease Samples. For example, you can also put your car on lease, if you want. Choosing for leasing is a great idea of opening an extra earning opportunity. 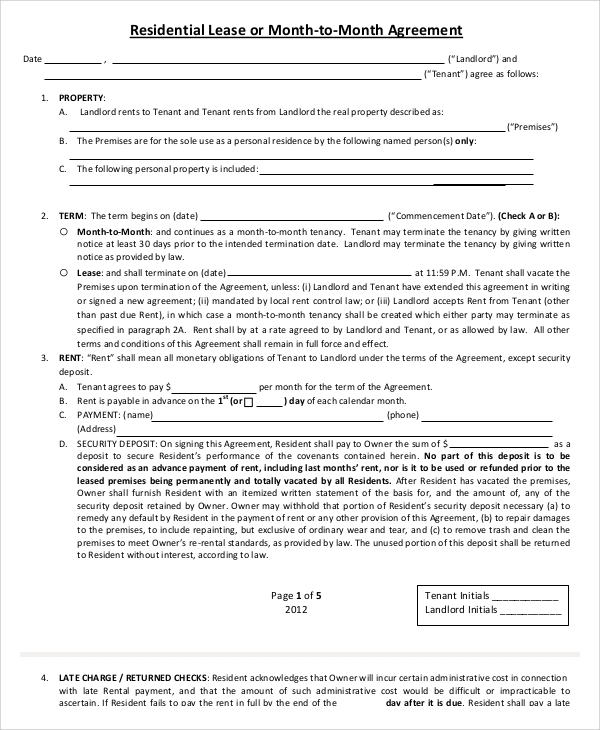 You can easily create a month to month lease agreement with the available online samples. Using these online samples will make the job simpler and accurate. Create your month to month lease agreement quickly whenever you want with the help of these samples. Month to month lease agreement is different from other lease agreements. As the name suggests, it is a monthly basis lease agreement which may require being renewed with the advent of time. Using a month to month lease agreement is effective as the contract needs to be renewed at a monthly basis. You can also see the Assignment of Lease Templates. Since it is not a long-term contract, there are limited risks and hassles involved in the process. The best way of creating a lease agreement contract is finding a legal solicitor. You can also draft your month to month lease agreement with the help of these online samples. Using the sample agreements is always useful as well as effective. 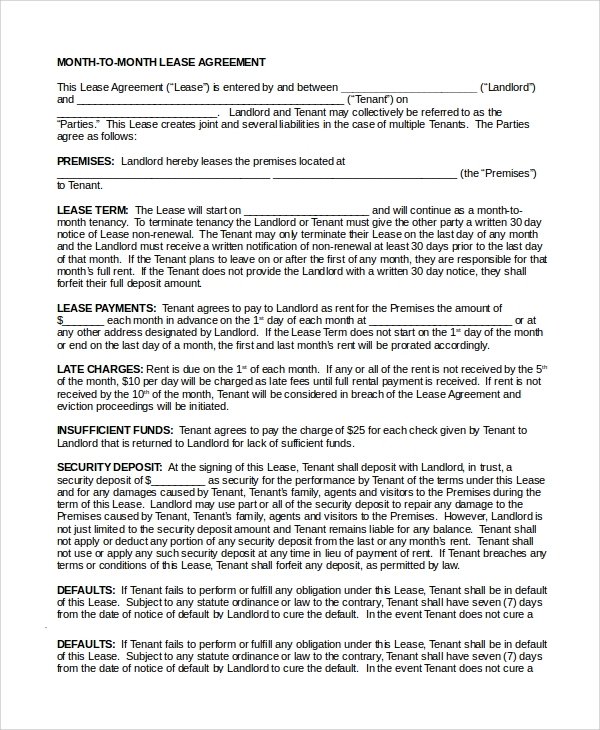 Creating a month to month lease agreement is a critical job. Even experienced legal advisors are not well versed with such jobs. You need to find a good contract agreement sample online. Using the sample agreement will help you to create the agreement with perfection. That will also make the process of setting up a monthly month lease agreement accurate.